Elections for the municipality and district school board happen this weekend in my part of the world. I already know who will get my votes. I have read the candidate Q and A's in the newspaper, read their leaflets, talked to many of them in person (this is a small town) and silently crossed off my list those whom I know have good intentions but perhaps not the necessary skills and/or related experience for the job I would be entrusting them to do for the community. I am impressed so many people have put themselves forward as candidates. Eight people are competing for municipal councillor in our district, two for mayor, and six for three school board positions. To have so much choice for leadership is a luxury for voters. Currently serving on two local boards, I am well aware of the commitment and work needed to properly do the job one is voted to do (hint: it is never enough). What is even more true of such positions is how misunderstood they are. Few people really know what goes on behind the scenes and just how much of one's time such positions can involve. I am not paid by taxpayers to do what I do on the boards I serve, but I can imagine the pressure I would feel if I were. I have had a taste of the bitter fruit of dissatisfaction and at times downright anger that comes from the caring public when my board has made an unpopular decision, and that is only within the small arts community here. I cannot imagine how crushed I would be if after years of dedication and public consultation I succeeded, for example, in building a bicycle lane from my town to the resort community down the road - something I would dearly love to see happen for the pleasure and safety of so many - and a large percentage of citizens despised me for it and thought nothing of hurling hate-bombs at me at public meetings and in the 'letters to the editor' section of our weekly paper. Many of us are far too eager to criticize those who make decisions on our behalf. Of course the internet has only made the situation worse. Newspapers demand names when writing a letter to the editor, but any Jo Schmo can leave a nasty comment on a website using an alias. To counter this current ugly trend I think this might be a good time to be grateful to the many people who care enough about our communities to run for council and school board and open themselves up to scrutiny from the discontented populace. Of course we also must hold them to account due to the fact that they will, in fact, work for us, but I also believe we could all benefit from counting slowly to ten before hurling those hate bombs. If we do our homework before making decisions on the issues at hand we will often realize there are, as my mother-in-law tends to say, three sides to every story. Engaging in a complaint session with the guy across the street for an hour does not make us an expert. 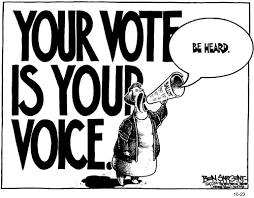 Asking questions, listening to answers, paying attention to what happens in other similar communities, reading the newspaper and attending the occasional council meeting or information session does not make us an expert either but it gives us a wee bit more credibility as a voter and community member. In my opinion, to give them credibility, municipal government must be made up of people who embrace the big-picture mentality. They must look at their role as a humble cog in the wheel of a forward moving vehicle, one they know full well will always move too fast for some and too slowly for others. They must work well with others and cooperate. They must listen more than they talk and be eager to consider new ideas. They must be prepared to back up their arguments against such-and-such a policy with plenty of research (they must enjoy reading or at least be able to study lots of dry documents). They must have the interests of the whole community at heart and not just one part of it. They must not be toadies of land developers. They must be people-persons. They must be open minded and scrupulously honest. They must not build anything extraordinarily ugly (Am I the only one who believes the raspberry sculpture in Abbotsford fits this category?) or environmentally irresponsible. Do I ask a lot of them? Absolutely. But no more than I would ask from myself. I thank everyone who has served for the past three or more years, especially a certain local farmer who has given three terms and deservedly wishes to spend more time with his family. I congratulate, in advance, all those who are elected for the next term to serve our community and our school children. You have your work cut out for you, but I hope you will perform it willingly and with at least a few of the qualities listed above. A friend once suggested I run for council. I responded thus: "I just can't get excited about drainage ditches, which seems like a very important issue here, so no. I will stick to the arts." For better or for worse, 'til death do us part it seems.